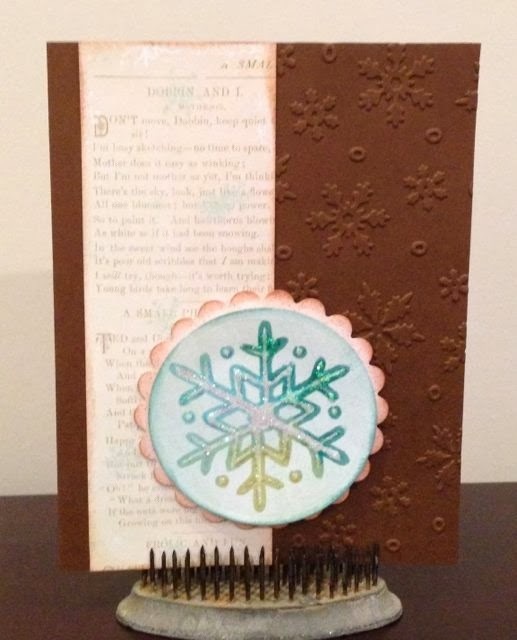 I was able to disappear to my craft room for a short time today in order to make a quick challenge card. This one is for another fun sketch challenge I found at Pals Paper Arts. Great winter card. I like how your snowflake coordinates with the embossing. Gotta' check out this sketch...they are a favorite. Great card! I love your snowflake. Your snowflake is so pretty.....and perfect against the embossed background! Hanks for joining us at PPA! Super cute Tammy! There are about a million trillion zillion snowflakes coming down tonight! Enjoy your warm day! What beautiful colors on that snowflake! Thanks for joining us over at Pals Paper Arts!